Preheat oven to 180°C/160°C fan-forced. Lightly grease an 8-cup (about 6cm deep) ovenproof dish. Finely grate chestnuts in a food processor. In a large bowl, combine milk, egg, butter and golden syrup. 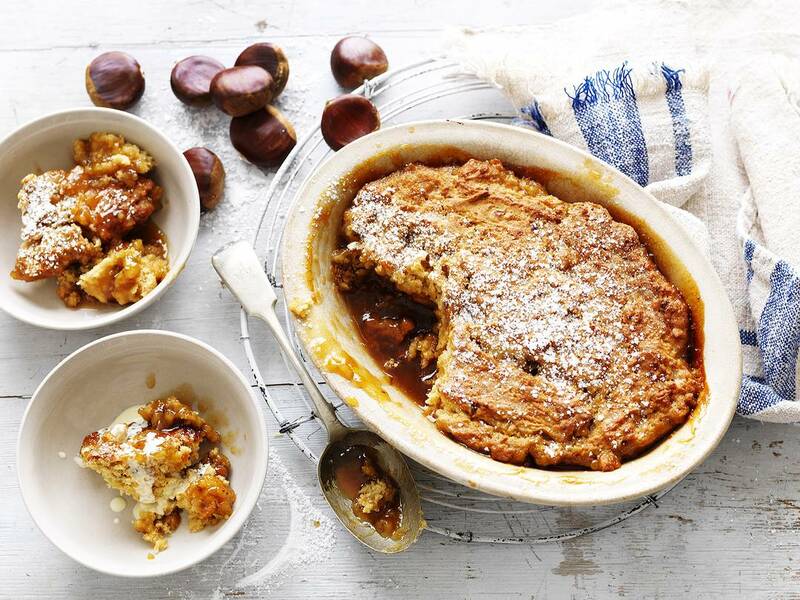 Stir in grated chestnuts, sugar and sifted flour. Using a large metal spoon, mix until just combined. Spoon into the prepared dish. To make the sauce, combine sugar and cornflour in a small bowl. Sprinkle over pudding. Combine water and golden syrup in a jug. Pour mixture over the back of large metal spoon over the pudding batter. Place dish on a baking tray lined with baking paper. Bake for 50-55 minutes until golden and pudding bounces back when gently pressed in the centre. Stand for 5 minutes. Dust with icing sugar. Serve with cream or ice-cream.